Moscow FM, broadcast on 105.2 FM, features a 20/80 percent mix of talk and music, with news and announcements interspersed with rock and pop tunes from the 1970s to the present. Source: Alamy/ Legion Media. Dial-surfing radio listeners were treated to an unfamiliar sound a few days ago — spoken English. That's because Monday was launch day for Moscow FM, the city's only English-language FM station, featuring local information and Western music. The station, owned by the city government, is aimed at making Moscow more accessible to foreigners of all stripes, from tourists to businesspeople, as well as helping Russians learn English. 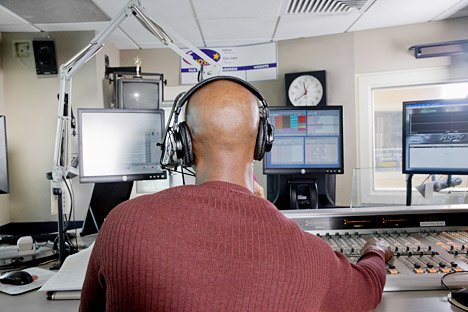 While observers welcomed the move, part of a larger effort to open the city to foreign capital, they questioned whether a radio station was the best investment of the city's PR funds. Moscow should start by making signs and museums bilingual, said Scott Antel, a partner at law firm DLA Piper who specializes in the hospitality industry. An estimated "150,000 foreigners work in Russia on a permanent basis. … Most of them are British, American and German" nationals who live in Moscow, the station said in a press release. About 4.5 million tourists visited Moscow last year, Mayor Sergei Sobyanin said in June. Moscow FM, broadcast on 105.2 FM, features a 20/80 percent mix of talk and music, with news and announcements interspersed with rock and pop tunes from the 1970s to the present. Its success will depend on balancing information for foreigners and expats, as well as on getting information to potential visitors outside of Russia, something that will require a good website, said Maya Lomidze, acting director of the Association of Russian Tour Operators. "Many foreigners are interested in information in Moscow, but that's fairly difficult to get because English versions of websites are rare," she said by telephone on Monday, adding that the government needed to focus on the Internet, including social networks, and broadcasts abroad. A radio station won't be enough to solve Russia's image problems abroad, Antel said. "The government's not going to solve that. Putting up a clever jingle isn't going to solve it," he said, adding that abolishing visas was the best thing the government could do to attract visitors. But Jeff Owings, a humanities teacher at the Moscow Economic School, a private K-12 institute, said the station was a great resource for English-language learners. “The biggest weakness that Russians generally have, once they reach a certain level of English, is being able to effectively listen and respond back. I think this radio station's going to be very good for that," he said by phone on Monday. Listeners who tuned in from 11 a.m. to 3 p.m. on Monday would have heard the voice of Pete Cato, a garrulous American who works nights as a bartender at Booze Bub. Cato didn't hide his first-day jitters on air, interjecting self-deprecating barbs in between announcements for local events, including a Mother's Day event at the State Darwin Museum of Natural History. "It's one thing when you know that bosses are listening, the ministry is listening. And then all of a sudden it's live and they're like 'We've got a couple of thousand people listening,' and you're like 'Oh, God,'" Cato said by telephone afterward. "It was fun, but I'm glad today is over." "I imagine myself sitting at the bar, just talking to my regular customers," he said, adding that he first heard about the job through a regular patron in July and trained intensively for the past two months. Local news consisted largely of upbeat announcements from the city, including plans for new metro cars and for the construction of 45 affordable hotels and Europe's largest hotel. "The editors give [the news] to us, and then we put our own personal spin on it," Cato said, adding that he doesn't get to pick the music either. State-controlled RT television provides news to the station on the half hour. The aftermath of Hurricane Sandy, a Greek austerity deal, and the latest on pop star Justin Bieber's love life were the headlines during one segment on Monday afternoon. Songs played included "Waiting for the Hurricane" by Chris de Burgh and Brainstorm's "A Day Before Tomorrow." "Trespassing," performed by American Idol runner-up, Adam Lambert, was played twice on Monday afternoon. The station is a "rocky-rock format," Cato said. Moscow FM is owned by Moscow Media, a media publications group owned by the city of Moscow that also includes television channels Moskva 24 and Moskva Doveriye, radio station Govorit Moskva, and Internet portal M24.ru. The city acquired Moscow FM's 105.2 frequency earlier this year from Next FM's Yulia Yakovleva. A spokeswoman for Moscow Media said by telephone that the station had an editorial staff of 18 but refused to say how much the city was investing or how many daily listeners it expected. The appearance of a state-run English radio station coincides with the disappearance of U.S. Congress-funded Radio Liberty, which went off the airwaves on Saturday after almost 60 years of broadcasting due to a new law that restricts foreign ownership of radio stations. Cato said state ownership didn't equate to censorship. "Especially given the new law, we can't talk about drugs and alcohol, you know, stuff like that. We can say, 'I went out and got drunk last night,' but you can't say, 'I went out last night and had nine glasses of rum,'" he said. "Other than that, there's no censorship."